I dredged this one up out of the archives. 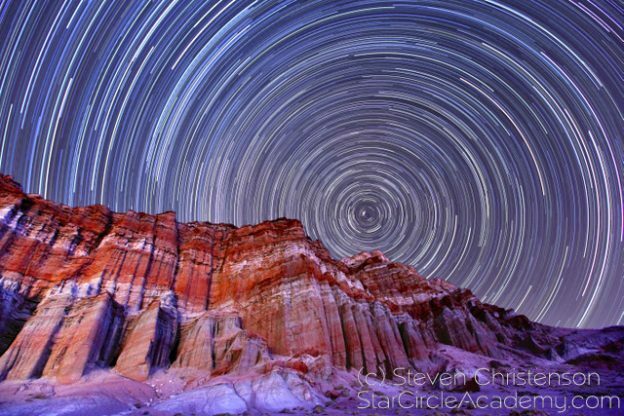 Many people ask me “how do you do those star trails, Steven.” If you want a grand overview of the process, my Treatise on Star Trails is a good read. However here I reveal step-by-step how I create a star trail image from the first shots to the finished image. 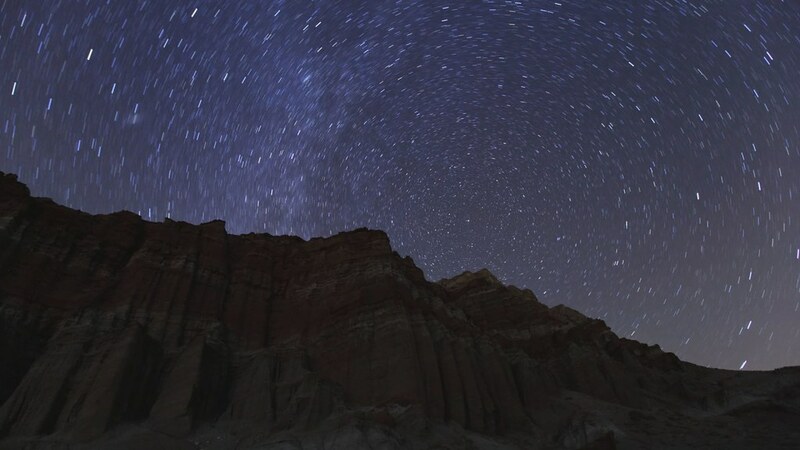 The method shown below is for creating simple (lighten mode) star trails. If you want to do some fancy effects, please take a look at our Advanced Stacker Plus. Photo 1: Quickly stacked image which is a composite of thirty-three 6-minute 500 ISO exposures and one 30 second, ISO 2000 exposure. The above is my first quick attempt at creating a star trail, and following is summary of how I created it. It starts with the test image and continues with the exposure set. For background on how to navigate the various shooting choices, see: the summary Stacker’s Checklist. The theory about selecting exposures may help. And there is a two-part series that addresses the difficulties you may encounter. See Part 1 and Part 2. If you’re curious how I get the stars to form circles, this article will provide the information. I usually start with a short (30 second or less), high ISO exposure to gauge several things: 1. How well framed my subject is, 2. How sharp the focus is, and 3. What I may need to adjust to control the sky-glow. Photo 2: First, image: ISO 2000, f/2.8, 30 seconds. After taking the first image, I realized two things: one is that the trucks passing were providing helpful light on my foreground – but not always illuminating the entire thing. The other is that the exposure (ISO 2000, f/2.8, 30 seconds) was under exposed. I needed to at least double the exposure to 1 minute. Let me stop for a moment. Those of you who don’t do much night photography are thinking “Whoa from 30 seconds to 1 minute is a huge difference.” But no, it’s not. It’s only one f-stop. It is no different from changing a daylight exposure from 1/200 of a second to 1/100 of a second. Starting with an exposure at 1 minute, 2000 ISO f/2.8 as a starting point I calculated an ISO 500, 6 minute exposures at f/3.5. Here is how: A 1 minute exposure at ISO 2000 is equivalent to a 4 minute exposure at ISO 500 (500 is 1/4 of 2000). Changing the aperture from f/2.8 to f/3.5 drops the light by about 33%, so I increased the exposure from 4 to 6 minutes. I set my camera to record in RAW and my interval timer to take 5 minute, 59 second exposures every 6 minutes. I pulled out my reclining beach chair, a sleeping bag and slept while the camera clicked. Below are a few of the shots. Note how the light changes from passing trucks! 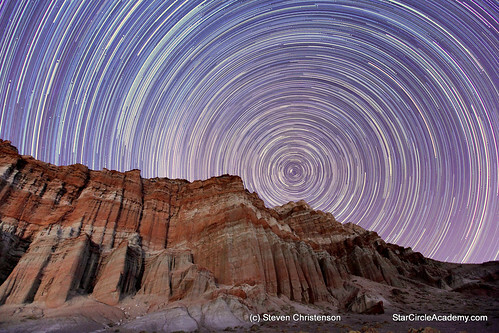 You can also see the counter-clockwise rotation of the Milky Way. The last shot was taken as twilight approached is too bright to use because the sky is losing contrast and the light on the cliff is looking flat. I did not include that last shot in the stack. Photo 3: Collage of some of the photos used in the stack. I downloaded all the images from my card to my Incoming folder which is organized by date. I used Digital Photo Professional to pull up the images, applied a bit of contrast enhancement, a slight exposure increase (1/3 of an f-stop), and a very slight noise control over the entire image. I exported in Landscape style which adds a slight saturation increase (Photoshop Saturation and Vividness) and modest sharpening. I cloned the recipe to all the photos and exported them into a “RedRockEast” folder in a temporary directory. I could have done all these things with ACR (Adobe Camera Raw) or Lightroom. In this case I didn’t have to do any white balance adjustments because I had preset the camera to approximately 4100K. Photo 4: First Results stacking 34 images in Image Stacker by Tawbaware – this is effectively a 3 hour, 24 minute exposure. The result was a little dark and flat so I used Picasa 3 to increase the exposure (called Fill Light), highlights and shadows – each by about 1/4 of the scale, and I warmed the photo by slightly tweaking the white balance (Color Temperature). That was all I needed to get the image shown in Photo 1. One obvious problem with the result is that the combination of the early short exposure with the sequence of shots left a gap. There really was no reason to include the first shot. I want the cliff to pop a bit better, so my next course of action was to work on improving the foreground. I found all the brightest shots of the cliff face (e.g. when the trucks were lighting them), and combined them using additive stacking to brighten them and averaging to reduce the noise. Remember that “brighten mode” (Lighten in Photoshop) does not brighten anything – what it actually does is select the brightest pixels at each location from each of the images in the stack. The brightest pixels may also be noise! Using averaging reduces the noise significantly – but it will not remove “hot” pixels; we will address those later. Fortunately Image Stacker has an option to stack and average. All you need do is specify the divisor. If you have 10 images and specify a divisor of 10 then you are simply averaging. But if you specify a divisor of, say 5, then you are averaging AND effectively increasing the brightness by about 1 stop. I used 12 images and a divisor of 3. And I made the same adjustment to the result in Picasa as I showed in Screen Shot 1. But I wasn’t happy with the result – the foreground still wasn’t bright enough. Photo 4: Additive stack of 10 images. Now my foreground is better, but I have created a new problem. The sky is over-bright and the hot pixels and the noise are significant as shown in a 100% crop below. The hot pixels here have a purple fringe to them. Sometimes hot pixels are tinged red, green, blue, white or gray. I will fix hot pixels in my next to last step using the clone stamp (Picasa’s retouch) or the healing brush in Photoshop. While the noise is obvious at 100% I think it will be fine so I am not going to address it. If I later find the noise intolerable I will go back and stack more images and average them. Or I may return to the original images and apply stronger noise reduction in Digital Photo Professional and re-export them. My next task is to remove the over-bright sky from the Photo 4, above. Sky removal is rather easy with the wand selection tool in Photoshop. I select all the sky and fill with black after making a few more tweaks to contrast and color. Photo 5: Sky removed and replaced with black. Since I now have a black sky version with the foreground as I like it, I can include this frame in any other stacks I make, and my foreground will be just as I want it. If I were working entirely in Photoshop, I would not have to fill with black, I could just use the result as a layer with only the foreground revealed by a mask. Since I had all the images for the stack, I was challenged on Flickr to also make a time-lapse video. This video below also helps to illustrate how stacking works. I collected the original thirty-three 6 minute exposures and cropped them to HD format (1920 x 1080). I then created and a sequence of stacked images using the intermediates option of Star Circle Academy Stacking action and joined them into an animation complete with a lovely snippet of the song Kidstuff by Acoustic Alchemy. In my next column, I’ll show how to create the time-lapse animation. This entry was posted in Hot or Dead Pixels, Image, Noise Reduction, Photo Processing, Photo Tip, Photoshop, Picasa, Stacking, Workshop and tagged action, California, Image Stacker, Movie, noise, noise reduction, Photoshop, Picasa, Red Rock Canyon State Park, stacking, Star Circle Academy, Step by step, timelapse, Tutorial on November 19, 2012 by Steven Christenson. The Elusive Milky Way - How to Find It! Brendan on Out Darn Gaps! Morgan on Out Darn Gaps!